When it comes to comfort food, nothing really beats sausage and baked beans … does it! This is just a more adult version of the children’s favourite. Pick your sausages carefully though! Using chicken sausages or low fat pork sausages bring the SmartPoints down significantly. Using ‘normal’ beef sausages would increase the recipe by 12 SmartPoints, so do check the SmartPoint value of your chosen sausages before you start cooking. What Sausages should I use? Not all sausages are alike! I’m lucky enough to live somewhere that the local butchers makes a great chicken breast sausage with very little fillers (such as breadcrumbs etc) but lots of flavour. I point these sausages at 2 SmartPoints per sausage. 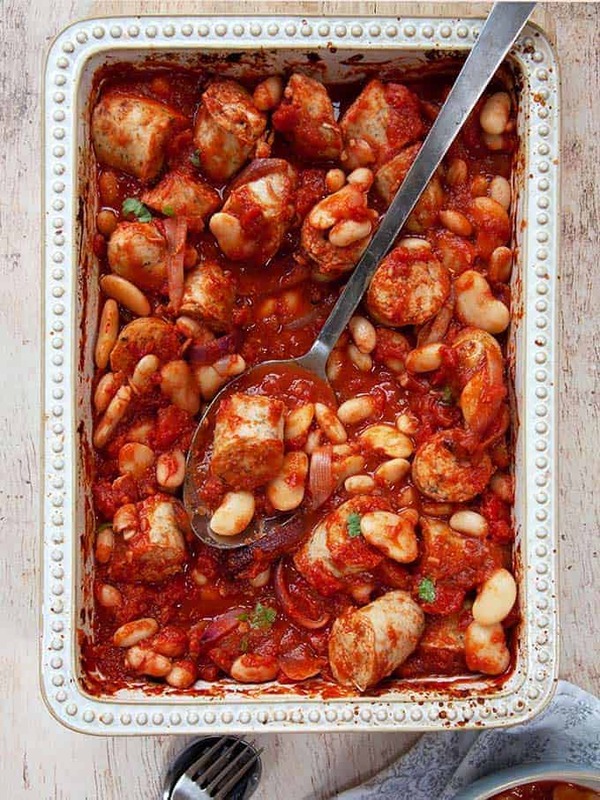 To keep this BBQ Sausage Casserole at 6 SmartPoints per serving, you can use up to 13 SmartPoints worth of sausage! Isernio’s Italian Chicken Sausages work out at 2 SmartPoints per link. 6 sausages would work out as 11 SmartPoints. Heck Chicken Italia Sausages – you could use 16 of these sausages for 11 SmartPoints!! If you are using thin sausages, such as Heck sausages you may need to alter the cooking times in this recipe. 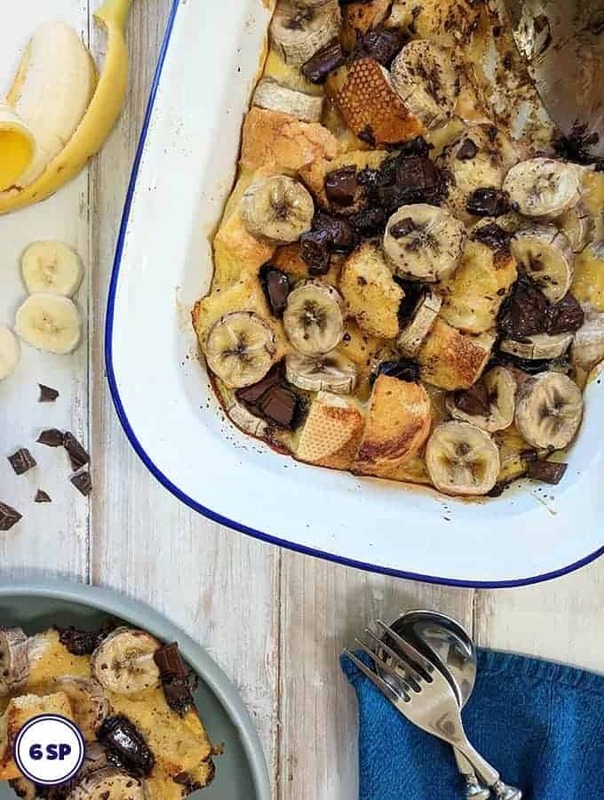 Can I swap Sweetener for Sugar in this recipe? 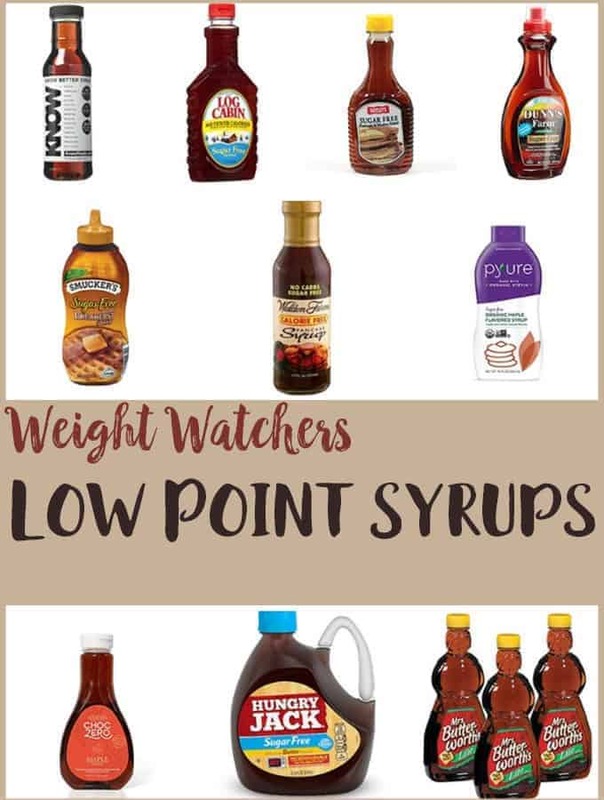 You will notice that there are 2 tablespoons of brown sugar in this recipe! 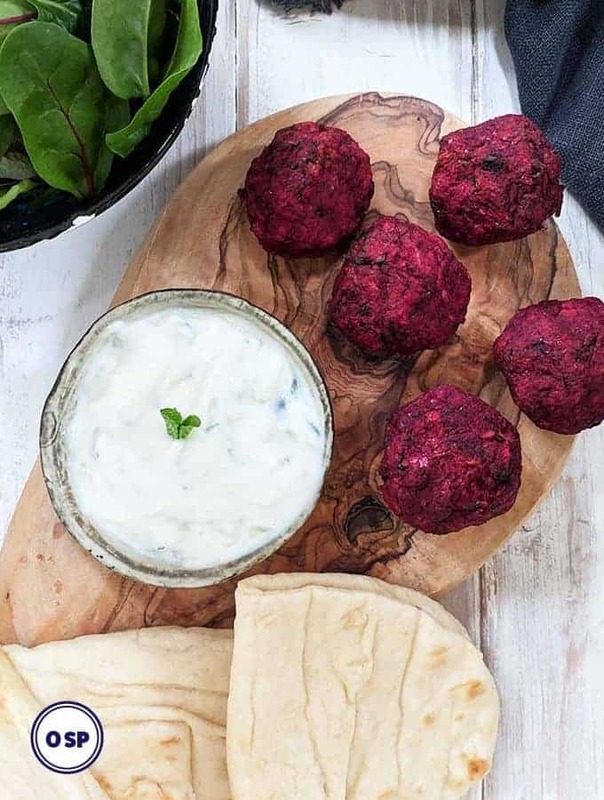 Don’t be tempted to leave it out as this is an important ingredient for the rich BBQ flavour of this dish. I have not made this dish substituting the brown sugar for sweetener. I therefore can’t vouch for how it would turn out. But, if you do decide to do the swap you can reduce the SmartPoints of the recipe by 1 SmartPoints per portion. 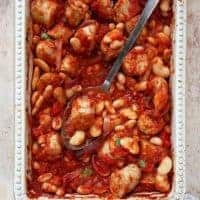 For this recipe, you can use any tinned beans that you have in your cupboards, but I prefer a mix of Butterbeans and Haricot beans. Brown the sausages by placing them in the oven with the onions and a little olive oil (picture 1). Add the garlic a few minutes before the end of the sausage cooking time (picture 2). Adding it before then runs the risk of it burning. And burnt garlic is not nice! Once browned, remove the sausages from the oven and chop into smaller pieces (picture 3). Stir in the remaining ingredients (picture 4) and return to the oven for 30 minutes until piping hot. Store in the fridge for 1 – 2 days. Heat through thoroughly before serving. The BBQ Sausage Casserole can be frozen. If you like one pot cooking you may also like this Chicken, White Bean & Bacon Casserole or perhaps this Creamy Chicken Casserole. These zero point Chicken Fajitas are also very popular. This easy, one pot BBQ Sausage Casserole is just 6 SmartPoints per portion on Weight Watchers Freestyle plan. Place the olive oil, sausages and onions in a large casserole dish and place in the middle of the preheated oven. Cook for 10 minutes, remove from the oven and turn the sausages over. Return to the oven for a further 5 minutes. Add the chopped garlic and cook for a further 5 minutes. 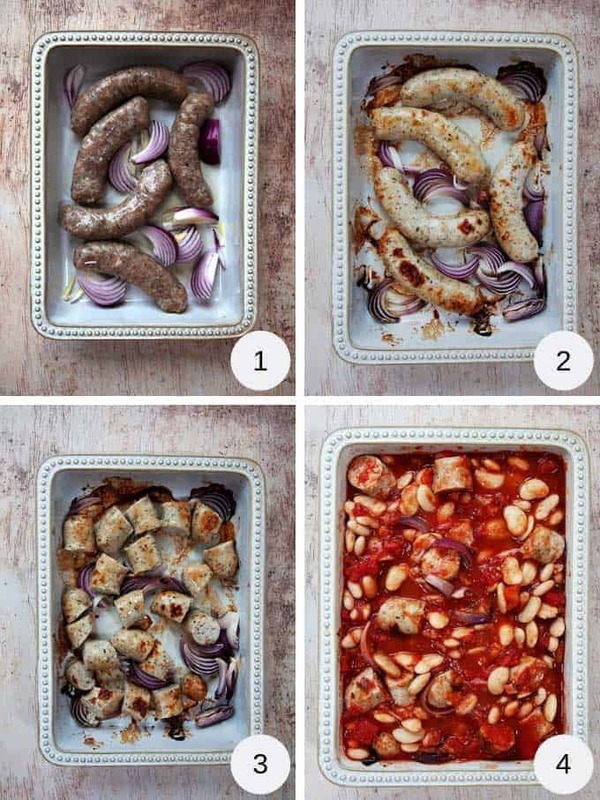 Remove from the oven and carefully slice each sausage into 4 or 5 pieces. 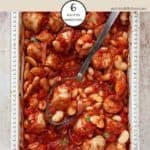 Pour in the tinned tomatoes and beans and add the remaining ingredients. Give the casserole a good stir before placing it back in the oven for a further 30 minutes until piping hot. Recipe sounds fabulous. I use the Heck sausages a lot but have you noticed their points value has risen recently?